The benefits of yoga and flexibility are numerous, but in this article, we will discuss 8 benefits of yoga for your Health. While flexibility may not seem a health benefit of yoga, many aches and pains in the body are caused by muscle imbalances. For example, lower back pain could be caused by tight hamstrings. Consistent yoga practice may help reduce joint pain by improving the flexibility of the muscles, and connective tissue which can improve posture. Yoga may significantly improve sleep quality due to the slow controlled breathing, meditation and general slowing down of movement and mind. Each yoga session ends in Savasana (corpse pose), lying on the back, controlling your breath and allowing relaxation through the body and soul. Studies have shown that yoga practice can improve the quality and length of sleep when practiced consistently. The same benefits we receive from yoga for sleep extend to reducing stress. Increased stress is a major cause of hypertension which is a problem in today’s society. The yoga position savasana has been shown in studies to reduce systolic blood pressure by 25 points over a three month period. Yoga involves moving through dynamic and static poses while breathing. This gently moves and massages the internal organs causing an increase in the lymphatic drainage. The lymph system fights infection and disposes of the toxic products in the body. 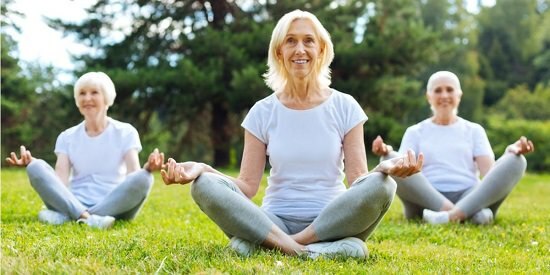 Studies have shown that the “full breath” taught in yoga helps patients with lung issues. After one month of practice, the respiratory rate can decrease from 14 breaths per minute to 8. There was also a noticeable increase in the oxygen saturation blood with regular training. Yoga has been shown to increase the maximum volume and efficiency of the breathing. There has been positive research showing a reduction in symptoms for asthmatics when partaking in regular yoga practice. Yoga can be relaxing and meditative, but it can also improve strength. While many poses are passive some require supporting your body weight, balancing on one leg, and holding poses over several breaths, all of which can improve muscular strength. It’s important to listen to your body during the strength poses and use modifications where necessary. Many poses require balance, strength and good postural alignment. These factors could be a great benefit to seniors whose risk of injury from falls may come from poor balance, poor muscle strength or lack of body awareness. The same studies have shown that yoga helps cancer patients cope with their experience. All these benefits can be had from regular, consistent yoga practice. If you are considering yoga, however, it is essential for beginners to find an excellent teacher to tailor the class to your level and offer modifications as needed.